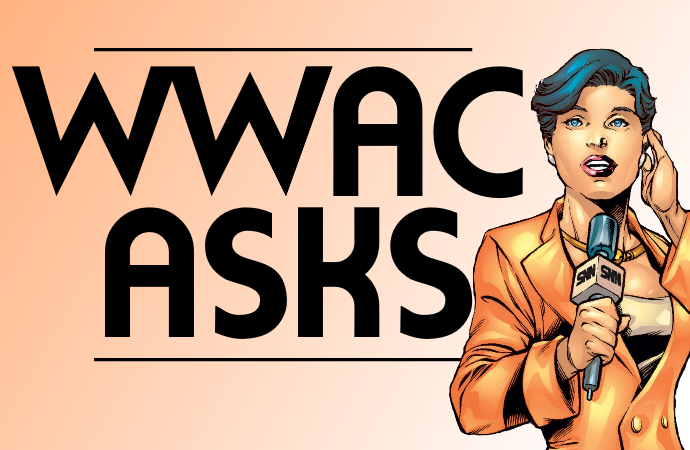 I went to Toronto Comic Con on Friday evening with one main goal—ask the creators in the Artists Alley one comics question for our new WWAC Asks.... column. I chose to do a fun question: If you could rename one existing comic book character, who would it be, what would you rename them, and why? 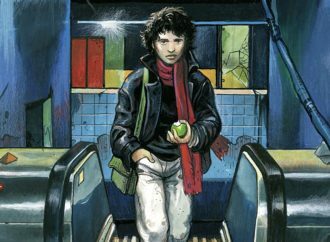 If you could rename one existing comic book character, who would it be, what would you rename them, and why? Maybe Nightcrawler. Only because I saw the movie Nightcrawler with Jake Gyllenhaal, and now when I hear it, I only think about the movie, and not Nightcrawler, the X-Man. I love Nightcrawler, he’s awesome, I’d love to go back to hearing Nightcrawler and think about the character, and not the movie, which creeped me out horribly! And this is coming from somebody who writes horror comics. Like, I was disturbed! I don’t know what I would rename him though. It would have to be Stiltman, because ‘Stiltman’ is a little funny, a little wacky, I’d rename him to anything, maybe Stretcho (suggested to her by her neighbour, Jason Loo), anything but Stiltman! 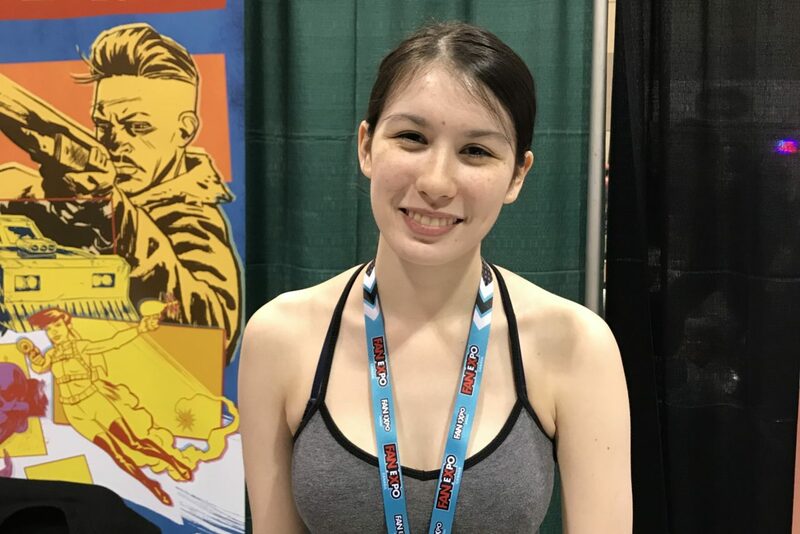 Megan Huang at Toronto Comic Con 2019. I’ve never been a fan of Spider-Man as a name, and I’ve never really liked the character, so I’d be fine with renaming Spider-Man. I don’t know what to call him. Superman, I don’t like that either. I think it doesn’t explain very well how super Superman actually is. Superman is a force of nature—Superman lands and things move. So, that’s a name I would like to change. I want to take the colour out of a lot of names—I don’t think you need to call Black Panther and Black Goliath that anymore, just call them Panther and Goliath. I think we live in more advanced times where people can figure that out for themselves. It’s all the ones that end in ‘man’ or ‘woman’; I don’t think you need that anymore. It’s a waste of time. Like Wonder Woman, just call her Wonder! We know she’s a woman, and if you think about it, in comics, chances are that the character is on the cover. So, yeah, drop the colour designations and the gender designations! Superman. I don’t know what I’d call him but he shouldn’t let anyone call him Superman, it’s too immodest! It’s the Canadian in me that thinks it’s not good to brag. I think he should just go by his Kryptonian name, just go by Kal-El. 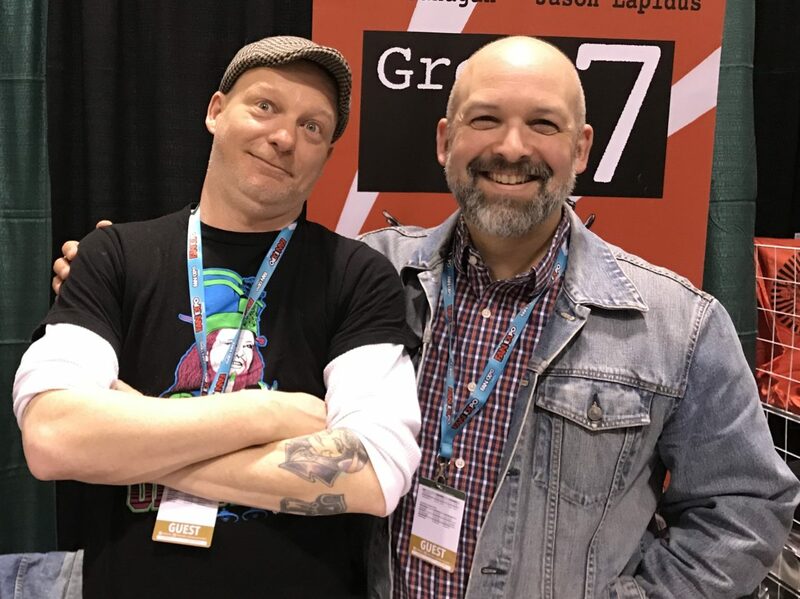 A. Shay Hahn and Jason Lapidus at Toronto Comic Con 2019. You know 3D Man? I’d probably rename him to something like Imax-Man, something to modernize the character. Because the way he was done in 3D, it was kinda binary, it’s not really how 3D works. Saturn Girl shouldn’t be called Saturn Girl, she should just be called Saturn Woman at this point! I did just see Captain Marvel a couple nights ago. If I could, I’d change it from Captain Marvel to Captain Badass! 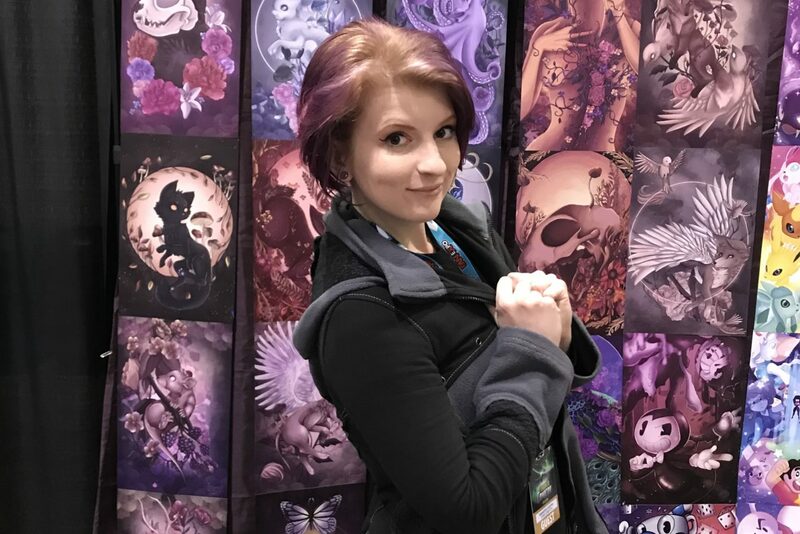 Sincerely Sam at Toronto Comic Con 2019. Probably Superman. I’d just name him Chuck! Why not? At least it has the ‘C’, like in Clark. So, yeah, I’m going with Chuck—final answer! 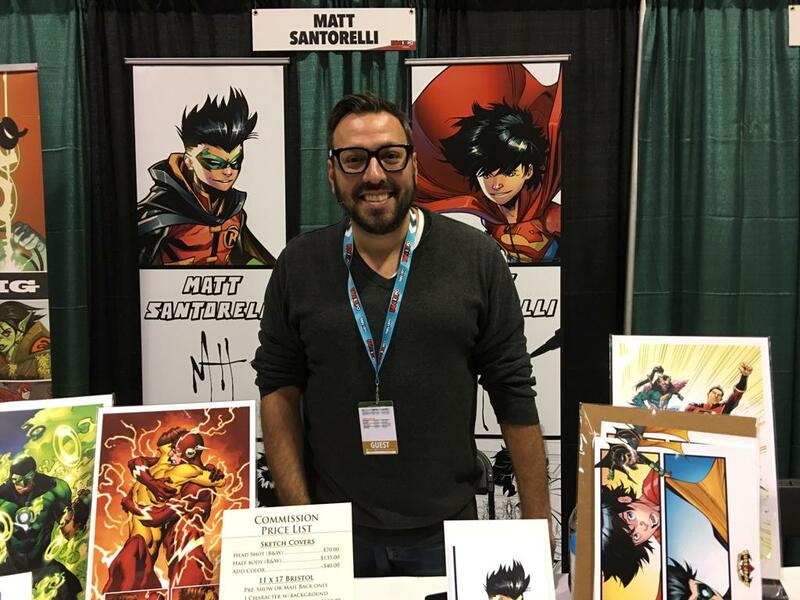 Matt Santorelli at Toronto Comic Con 2019. I’m genuinely stumped, because a rose by any other name would smell just as sweet. If you’ve got a character like Ant-Man, and it’s a dumb name, if you call him by another name, like Goliath or Yellowjacket—which they did—it didn’t make him a better character! Yellowjacket beat up his wife, but Ant-Man was nice! The rose might smell as sweet, but one of them might abuse his wife. You know, I’d rename Hawkeye’s real name–it’s Clint Barton—if you spell that and the inks run together, it spells a rude word. So, I would rename him just in case there are printing errors. All people named Clint are now named Hedgehog, because no matter how that’s printed, no one will get offended! Well, there you have it: the comic book characters comic creators would like to rename. It’s interesting how many of the creators homed in on established characters, but I personally agreed with the need to drop the colour designations from African-American characters. Which character would you rename? Drop us a line in the comments below! Billy Batson: Calling him "Shazam" first and firstmost is silly for a host of reasons. I would go with the OG name of Captain Thunder, which was only dropped because of another character back in the Golden Age with that moniker who nobody now remembers outside of that factoid. Either that, or "Captain Shazam", in the very least, even it that’s still flawed as he still can’t introduce himself without transforming. If something else were to come up, I’d at least want it to sound like something that a twelve-year-old in his position might come up with on his own, rather than something that’s assigned to him. Gypsy: Shouldn’t need to explain that one; her name is a slur. It likely wasn’t intended malice on behalf of her creators or those that have worked with her since, but that’s we have. I dunno what ELSE you’d call her, but I’d really like a change on that one. Silk: I’m again not sure what else you’d call Cindy Moon; I just want something that has a bit of punch to it, so it’s more likely she’d stick in people’s minds and thus stick around more often.